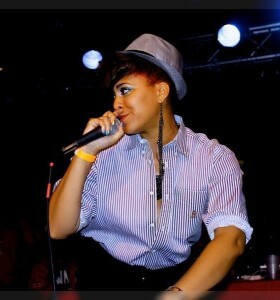 Richelle Scott known as Gemini in the artist society started taking an interest in performing poetry in 2007. She was 18 when she realized this was her passion. In 2010 she took an interest in slam and placed 3rd at the Southwest Shootout Regional Slam. Then she place at the Dallas Slam to lock a spot on the team to go on to Nationals. The team placed top 20. When she returned from Dallas she featured many colleges, poetry slams, and all kinds of events around the US. She writes from her and her family`s experiences. She is now attending University of North Texas for a BA in Integrative studies of Sociology, Anthropology, and Philosophy. She started a organization at the university in 2007 called Poetic Justice that is still going strong. She will be graduating August 2015. She is a mother of two beautiful boys. She lives in Houston and works at Memorial Hermann Hospital. She continues to perform in shows and is working on various projects. You can follow her on Twitter and Instagram @ RichelleGemini, Facebook Richelle Gemini Scott to keep up with her upcoming shows and projects. My government name is Vallerie Birdow. I’m 26 years old. I was born in Fort Worth, raised in Cuney, Texas, and went to school k-12 in Palestine, Texas. I graduated from PHS in 2006, then moved to Houston to attend Texas Southern University. I transferred to UT Tyler after my junior year where I’m currently completing the Bachelors of Arts in psychology degree program. 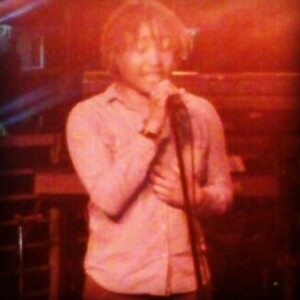 I got into poetry while going out to open mic venues when I was living in Houston. I was intrigued by the energy in the places. It was always calm, yet exciting. I loved watching artists bare their souls before crowds. I started writing as a way to release stress and tension and decided to perform a personal poem one night at an open mic. I got a great response from the audience and they seemed to like it so I started writing more and releasing on stage at whatever open mics I could find. After an open mic performance at Heroes Lounge for the first time, I was asked to be a feature, and that has been my only breakthrough in poetry thus far but I hope to have more. 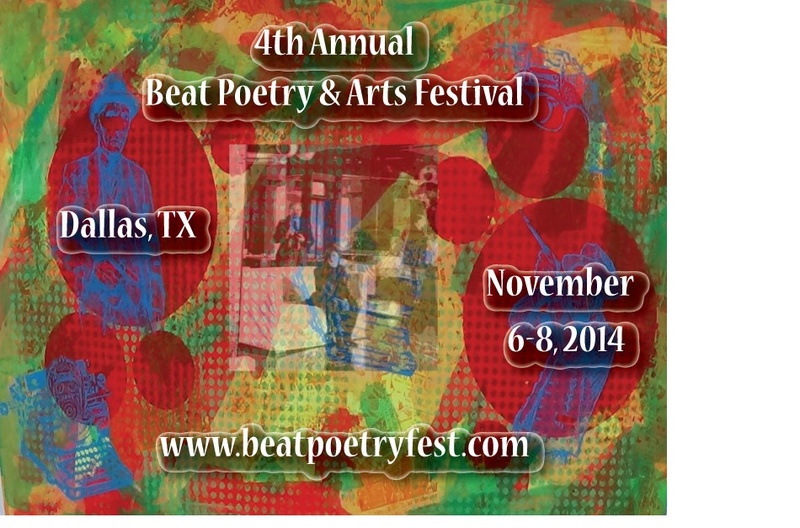 What: Dallas is the site of the 2014 Beat Poetry Festival. In conjunction with this free featival, WordSpace sponsors Chuck Taylor’s Memoir workshop and Christopher Carmona’s poetics workshop. When: The festival begins on Thursday, November 6 and runs through Saturday night, November 8. The workshops are 10-12 for Memoir, and 12-2 for Poetry. Both workshops are free. Registration for the festival is open until October 16th and more information can be found here. More coming on venues and readers for this beatific festival coming soon. The Beat Poetry Festival was founded by a group of Texas poets, inpsired by the movement made famous by writers like Jack Kerouac, Allen Ginsberg and William Burroughs, The 4th Annual Beat Poetry Festival will be held this year in Dallas, TX on Nov. 6-8. Organizers Christopher Carmona and Chuck Taylor will be offering workshops. Christopher Carmona was a nominee for the Alfredo Cisneros de Miral Foundation Award for Writers in 2011 and a Pushcart Prize nominee in 2013. He has been published in numerous journals and magazines including Trickster Literary Journal, Interstice, vandal., Bordersenses, the Sagebrush Review, and tecolote. His first collection of poetry called beat was published by Slough Press and his second book, I Have Always Been Here is published by Otras Voces Press. He is also editing a Beat Texas anthology called The Beatest State In The Union: An Anthology of Beat Texas Writings with Chuck Taylor and Rob Johnson and is working on a book called Nuev@s Voces Poeticas: A Dialogue about New Chican@ Poetics with Isaac Chavarria, Gabriel Sanchez, & Rossy Lima Padilla to be published by University of New Mexico Press in 2015. Currently he is the organizer of the Annual Beat Poetry and Arts Festival and the Artistic Director of the Coalition of New Chican@ Artists. Visit his website here. Chuck Taylor is a Texas Yankee reared in Texas, Minnesota, Illinois, and North Carolina, won the Austin Book Award for his collection, What Do You Want, Blood? He has worked in the Poets- in-the-Schools program, been a CETA poet in Salt Lake City, operated a used bookstore, worked in the laundry of a hospital, labored for the Terrill State Mental Hospital and the Texas School for the Deaf, owned a small press, and is the former Coordinator of Creative Writing at Texas A&M University. Conversations with the poet Lucien Stryk in 1967 stimulated his interest in Asian culture and he was able to work and study in Japan from 1991-94. Married three times, he has three children, three stepchildren, and six grandchildren. He is the author of several collections of poetry, including most recently, Like Li-Po Laughing at the Lonely Moon (Pecan Grove, 2008). VIP Reception: 6:30-7:30, Refreshments provided by Buttons! Master Class Enrollment is limited. To apply go here. WordSpace is honored to partner with South Dallas Cultural Center to present great writers in conjunction with their theater series “Black Pain Black Power”. 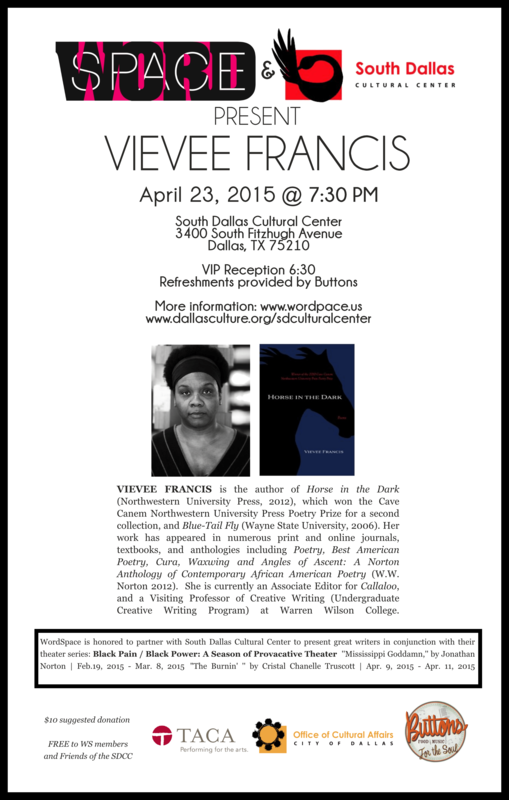 Vievee Francis is the author of Horse in the Dark (Northwestern University Press, 2012), which won the Cave Canem Northwestern University Press Poetry Prize for a second collection, and Blue-Tail Fly (Wayne State University, 2006). Her third book, Forest Primeval, is slated for release in 2015 (Northwestern University Press). Her work has appeared in numerous print and online journals, textbooks, and anthologies including Poetry, Best American Poetry, Cura, Waxwing and Angles of Ascent: A Norton Anthology of Contemporary African American Poetry (W.W. Norton 2012). She has also been a Poet in Residence for the Alice Lloyd Scholars Program at the University of Michigan. In 2009 she received a Rona Jaffe Writer’s Award and in 2010, a Kresge Fellowship. She is currently an Associate Editor for Callaloo, and a Visiting Professor of Creative Writing (Undergraduate Creative Writing Program) at Warren Wilson College in Asheville, NC. With everything from classes for the education-minded to finger-poppin’ jazz jams for the young and the old hipsters, the SDCC, located just outside the Fair Park complex, is a community resource for all Dallas residents. With a wide variety of programs inspired by the vibrancy and diversity of the African Diaspora, the SDCC seeks to educate and inspire through the visual, media, literary and performing arts. 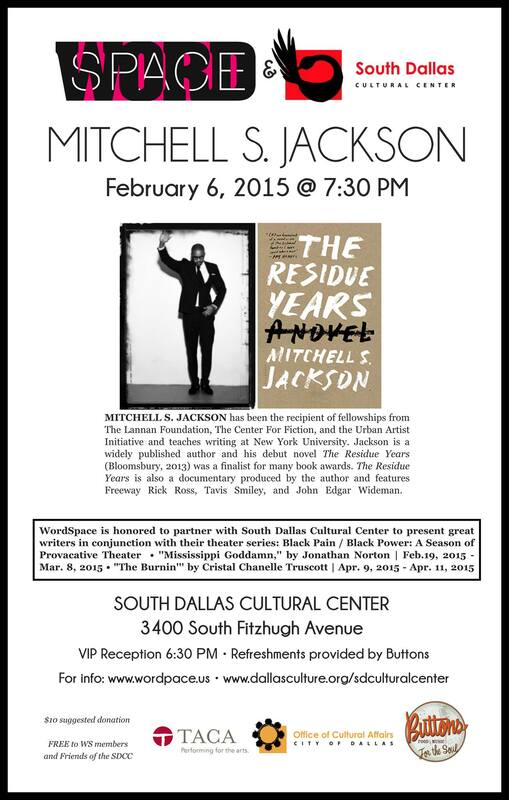 Join the South Dallas Cultural Center on facebook and sign up to receive our e-newsletter! Buttons is built around the idea that the ‘love of great food’ and ‘music’ are universal, the idea that diversity is beautiful and that all people have much in common. We strive to offer much more than a plate of great food…we create a great experience. Create a great experience by serving award winning food accompanied by soulful live music. Treat each and every guest like we were inviting them into our homes. Those are the guiding lights for Buttons, and while they are few we believe if we follow them we can achieve great things together. 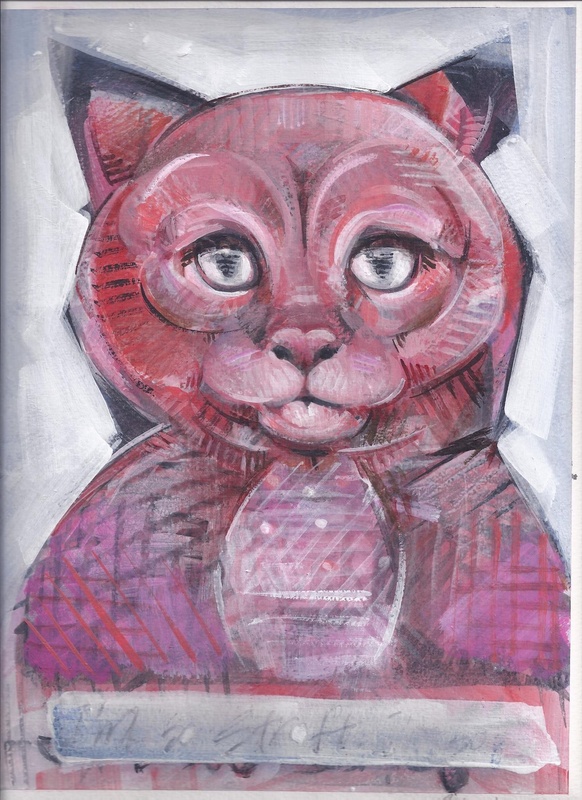 In conjunction with the artists reception for the Cat Show, Wordspace closes out this year’s Artspeak Series with a Holiday Jamnation featuring Randall Garrett and Inferno Texino with Andy Don Emmons, Clay Stinnett, Jason Cohen and Mark Martinek. Expect the big throwdown around 9 with unexpected guests and spontaneous combustions! Due to unforeseen circumstances LeAnne Howe has cancelled her upcoming Dallas appearance. Stay tuned for new dates. LeAnne will be guest presenter at the Yavneh Academy Arts Day, annually organized by Dr. Tim Cloward. LeAnne Howe (born in 1951) is an American author and English Department Chair at University of Georgia. An enrolled member of the Choctaw Nation of Oklahoma, Howe’s work has been published in a variety of journals and anthologies. Her book Shell Shaker received the Before Columbus Foundation‘s American Book Award for 2002. Howe is an author, playwright, and scholar. Born and educated in Oklahoma, she writes fiction, creative non-fiction, plays, poetry, and screenplays that primarily deal with American Indian experiences. She has read her fiction and been an invited lecturer in Japan, Jordan, Israel, Romania, and Spain. Founder and director of WagonBurner Theatre Troop, her plays have been produced in Los Angeles, New York City, New Mexico, Maine, Texas, and Colorado. Howe is the screenwriter and on-camera narrator for the 90-minute PBS documentary Indian Country Diaries: Spiral of Fire. The documentary takes Howe to the North Carolina homelands of the Eastern Band of Cherokee Indians to discover how their fusion of tourism, community, and cultural preservation is the key to the tribe’s health in the 21st century. She is also writer/co-producer of a new documentary project, Playing Pastime: American Indian Fast-Pitch Softball, and Survival, with three-time Emmy award-winning filmmaker, James Fortier. The story is about the southeastern tribes and Indians who have been playing baseball and fast-pitch softball since the 1880s in Indian Territory, now Oklahoma. Production began in August 2004. Howe’s first novel, Shell Shaker (Aunt Lute Books, San Francisco), received an American Book Award in 2002 from the Before Columbus Foundation. The novel was a finalist for the 2003 Oklahoma Book Award, and awarded Wordcraft Circle Writer of the Year, 2002, Creative Prose.Equinoxes Rouge, the French translation, was the 2004 finalist for Prix Médicis étranger, one of France’s top literary awards. Evidence of Red (Salt Publishing, UK, 2005), a collection of poetry and prose, rails against lost lands and lovers, heralds death and mad warriors, and celebrates a doomed love affair between Hollywood’s invented characters: “Noble Savage” and “Indian Sports Mascot”. This collection of lyric and prose poems won the Oklahoma States Book Award in 2005. Portions of the book were featured in the third edition of The World Is a Text(Prentice Hall, 2008) by Jonathan Silverman and Dean Rader. Though she is best known for her fiction, Howe is also an accomplished scholar. She has authored a book chapter on Choctaw history, contributed two important essays on her theory of “tribalography”, and collaborated on literary criticism projects with Craig Howe (no relation), Harvey Markowitz, and Dean Rader. Howe has been a visiting professor at Carleton College, Grinnell College, Sinte Gleska University in Mission, South Dakota, on the Rosebud Sioux Reservation, Wake Forest University, North Carolina, and at the University of Cincinnati in the Women’s Studies Department. In 2003 she was the Louis D. Rubin Jr. Writer-in-Residence at Hollins University, Roanoke, Virginia. In 2006-07 she was the John and Renee Grisham’s Writer-in-Residence, University of Mississippi, Oxford, MS. In May 2008, Howe was awarded a Poetry Fellowship at Soul Mountain Retreat, sponsored by former Connecticut poet Laureate Marilyn Nelson in East Haddam, Connecticut. In March 2010, Miko Kings: An Indian Baseball Story was the 2009-10 Read-in Selection for Hampton University, Hampton VA. Hampton University also held a mini-literary conference on Miko Kings. Ten papers and 3 panel discussions were given on the novel during the conference. In March 2011, Howe was awarded the Tulsa Library Trust’s “American Indian Author Award” at the Central Library, Tulsa Oklahoma. In 2010-2011, Howe was a J. William Fulbright Scholar in Amman, Jordan where she taught American Indian and American literatures at theUniversity of Jordan, Amman. She was also researching a new novel set in both Transjordan, 1917 and in Allen, Oklahoma, 2011. Currently Howe is a Professor at the University of Illinois, Urbana-Champaign in American Indian Studies, English, and Theater. Students who have worked with Howe have gone on to work for the Chicago Sun Times, and The New York Times. They are both native and non natives who have published memoir, poetry, and creative non-fiction. Some former students are now working in professional theater companies, while others are teachers. In 2012 Ms. Howe was the recipient of a United States Artists Fellow award. Join us and thousands of other North Texas in support of the many nonprofits supporting your community! North Texas Giving Day is an online giving event that provides nonprofits the opportunity to gain exposure to — and start relationships with — new donors, and for people in North Texas to come together to raise as much money as possible for local nonprofits. Help us support the literary arts community in Dallas by donating!